Yesterday, The Observer in London, printed this open letter from Black Swan Author Nassim Nicholas Taleb that he wrote to Conservative Leader David Cameron urging him NOT to follow in the path of the United States. 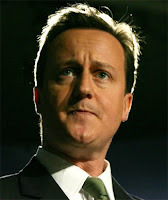 Cameron dare not copy Obama's disastrous economic policies. Should he come to power, the Conservative leader must avoid the calamitous mistakes of the American president. You and your party may be the only hope we have for a resilient society insulated from negative Black Swans and in which everyone has the opportunity to benefit from positive Black Swans. For I despair of the Obama administration's ability to fix this financial crisis and prevent future ones. I am appalled by the dangers it has been creating and its takeover by the same economic establishment responsible for this crisis. What is a Black Swan? It is a low-probability, high-impact event that, because of its rarity and the instability of the environment, cannot be scientifically evaluated in terms of risk and return. Although Black Swans are rarely predicted, they are retrospectively seen as having been anticipated, which makes us overestimate our abilities to see them coming. Black Swans can emerge as a result of our intellectual arrogance and our ignorance of our limitations. Some elements of the future are simply beyond our grasp. 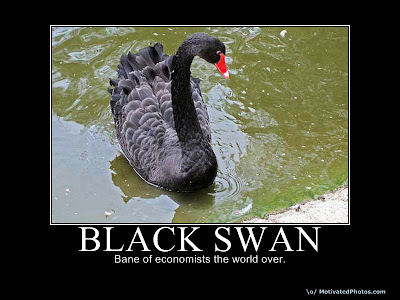 Much of history has been dominated by Black Swans, both positive and negative. These deviations are the main reason economic theories and forecasts do not work, since the exceptional and unforeseen high-impact event plays a large role in economic life. We live in an increasingly complex system and complexity causes Black Swans. How? The more interdependent we become, the harder it is to trace the cause of an event and the tougher to forecast accurately, meaning the traditional tools of economics will fail us. And since the spread of the internet, rumours go round the world in minutes. Consider the run on Icelandic banks. It took place at BlackBerry speed. So the economic variables, such as sales, commodity prices, unemployment or GDP growth, are subject to ever more extreme variations. The over-efficiency of the systems means things run smoothly, but are subject to rare but violent blow-ups. David, you must counter this complexity by lowering indebtedness. We have known since Babylonian times that debt is treacherous and allows no room for mistakes: felix qui nihil debet goes the Roman proverb ("happy is he who owes nothing"). The combination of debt levels swollen from two decades of over-confidence with modern finance's complex derivatives has been disastrous. Be careful, too, of the so-called science of economics. Economists have been no better in their predictions than cab drivers. We have an "expert" problem, in which the expert provides you with misplaced confidence, but no information. Because we think, correctly, that the dermatologist, the baker, the chemist are true experts (they know more about their respective subjects than the rest of us), we swallow the canard that the economists at the International Monetary Fund, the World Bank, the Bank of England and the US Federal Reserve are also experts, without checking their record. This reliance on faux experts is, for the most part, what got us here. Now it is continuing with the build-up of government deficit and an increased reliance on flimsy forecasts by the Obama administration. This problem with experts was particularly acute when it came to the "risk models" on which bankers built those positions that turned sour. So it is that you are coming under pressure to provide more regulation. Alas, the need for more regulation is a myth. I have been fighting risk models both as a Wall Street trader and as a professor and my worst nightmares were the results of regulators. It was they who promoted the reliance on ratings by credit agencies. The "value-at-risk" models regulators promoted made us take more risks. If we are to have regulators, we need them to operate along conservative lines and conserve the rich knowledge and understanding of risk transmitted through generations of practice, of trial and error. We replaced the heuristics of the elders with arrogant (and incompetent) beliefs, breaking, in the name of science, the chain of knowledge. Old, conservative bankers and traders have been replaced by keen young mathematical analysts, yet anyone who listened to a grandmother who survived the Depression would have been warned against debt and been better prepared than Ben Bernanke and Alan Greenspan, respectively chairman and former chairman of America's Federal Reserve. 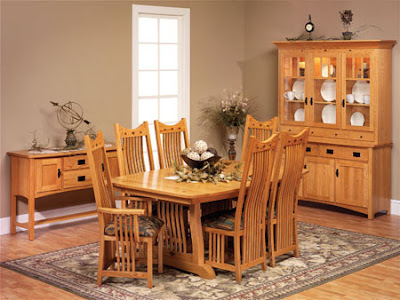 The solution is obvious: build an economy that increases the role of well-tested traditions. Ban financial derivatives that require advanced mathematics rather than trial and error. Look at mother nature. There is a complex system built around sound principles that has insured both evolution and survival. It does not let anything get too big to fail. It breaks things early. I don't understand why people who stand against tampering with nature accept tampering with the economy that would have organically grown too. Work on building a "robust" society, capable of withstanding errors, in which the role of finance (hence debt) would be minimal. We want a society in which people can make mistakes without risk of total collapse. Silicon Valley offers a good example, where people have the chance to fail fast (and repeatedly). The best blueprint is the very opposite of the Obama administration's economic policies (its foreign policy is commendable). It has been administering pain-killers without addressing the cause of disease. Obama is strengthening those who do the wrong thing. Take the "cash for clunkers" programme. It is a handout to those who bought the wrong – uneconomic – car. He is penalising people who did not make a mistake. The same applies to other "rescues". By raising taxes after the crisis, the administration is hampering evolution. Those who do well in difficult times end up paying more tax and those who lost money in the crisis pay less. The rich who got us here are being rescued by regular Joes and being subsidised by the tax system. Obama is giving the large institutions that failed us, like the IMF and the World Bank, even more powers. He is increasingly dependent on the visionary expert who failed us and does not understand the properties of complex systems and stifling long traditions of wisdom in understanding risk. Just consider the players: Larry Summers, director of the National Economic Council (who, among other things, made both Harvard University and the banking system more fragile), Bernanke (who increased reliance on the error-prone "models") and Tim Geithner, secretary of the US Treasury (who failed to understand that property prices can take extreme deviations). I am particularly depressed because, having been disappointed by George W Bush, I had high hopes for Obama. David, spare us from such hubris. 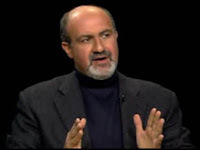 Nassim Nicholas Taleb, author of The Black Swan, is a professor of risk engineering at New York University. Damn straight, Nassim, damn straight! I would suggest that people forward Nassim’s letter to the White House, but I know exactly where it will land – upon deaf ears by those who derive their living from the “generosity” of the central bank.